Some people consider Prince Philip, the Duke of Edinburgh, Consort of Queen Elizabeth II, to be ever so slightly eccentric in his remarks and behaviour, but he is nothing in comparison to his late mother, Princess Alice of Battenberg, who married his father, Prince Andrew of Greece, in 1903. Many would say that Prince Philip looks remarkably like his late father but gets at least some of his personal characteristics from his mother. It did not help that Alice, a great-granddaughter of Queen Victoria, was born with a serious hearing impediment that got steadily worse as she got older. She was certainly intelligent, and she was able, on occasion, to use her deafness to her advantage. However, her interest in spiritualism and religion led her to indulge in increasingly bizarre behaviour. It was one thing to play the Ouija board and believe that packs of cards were conveying messages from the dead, but quite another to say that she was going out to dinner with Jesus, with whom she was apparently having an extra-marital affair, or to believe that she had her own group of disciples in Bedfordshire. In 1930, when her son Philip was only nine years old, she was diagnosed with paranoid schizophrenia and removed from her family to be lodged in a series of psychiatric institutions. Philip was sent to England to live with his uncles, Louis and George Mountbatten (the name change from Battenberg had been done to make the name sound less German during World War I). Contact between Alice and her family only resumed in 1937 when they met at the funeral of one of her daughters, Cecilie, who had been killed, together with her husband and two of her three children, in a plane crash. After the funeral Alice returned to Athens to work among the poor. 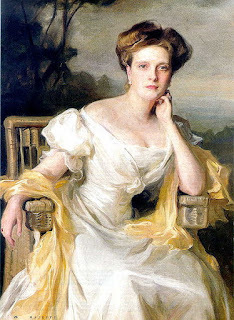 It is understandable that she would have been confused by the war that broke out in 1939, given that all her four daughters had married into German nobility, who fought on the German side and at least one of whom was a member of the SS, whereas her son was fighting on the British side as a member of the Royal Navy (which was where he met Princess Elizabeth). When Philip married Elizabeth in 1947 none of the surviving daughters were invited to the wedding, due to the German connections. Alice’s husband, Prince Andrew, had died in 1944, after which she devoted herself to founding an order of nuns, although she was never ordained as one herself. She took to dressing in a nun’s habit, including at the Coronation of Queen Elizabeth in 1953. She lived out her final years in Buckingham Palace, still dressed as a nun. The Palace staff described her as “strange but likeable”. She died in 1969, have declared her wish to be buried in Jerusalem. When one of her daughters objected that her family would find it difficult to visit her grave, her reply was that there was “a perfectly good bus service”. There does not appear to have been an ounce of ill-will in her, except to the German army that occupied Greece. There is plenty of evidence that she endured many personal hardships during the war years and performed many good deeds at personal risk, including sheltering Jews and distributing rations during the curfew. It is hardly surprising, though, that her son, having had such a disturbed upbringing, has been notable for trying to instil the values of self-discipline in his own family, with varying degrees of success. It is also notable that he has always had a strong independent streak that has got him into trouble at various times. This would seem to have been inherited from his mother.